I couldn’t wait to try out Martha Stewart’s Apple Cupcakes so used the opportunity to experiment on Sunday as the church needed some cakes for their cake sale. These cupcakes didn’t turn out as round as my others but that was more my fault for not taking time to read the recipe properly but they tasted delicious full of apple, cinammon and nutmeg so I will be making these again. I topped them off with a cream cheese icing and an apple I made out of red fondant to which I added a clove for the stalk (thanks Lisa – the quiet one fot the idea) and they not only smelt and tasted delicious but they looked really cute. 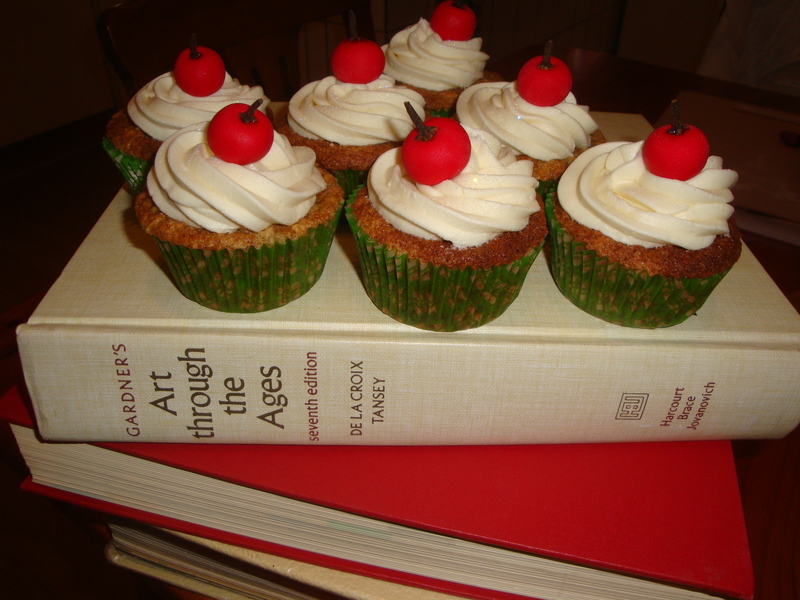 I copied Martha Stewart’s brilliant way of displaying her apple cupcakes as I thought it was really clever. ← Just for the Irish Summer and Anna! I bet you those sold like ‘hot cakes’! Yes they were gone really quickly. I think I should get a Noddy badge don’t you? They look absolutely delightful, made me smile. Thanks also made me smile when I saw them on Martha Stewart’s website. I will be doing these as well as others for the market at Second Cup on 30th July from 9am – 4pm so can’t wait to see the response to them. I love these! Glad you’re making them for the market but I guess we’ll have to get there early before they all sell out. Your blog is looking really good Lisa – well done! Thanks Tracy. Looking forward to Saturday’s market and hoping it will be a few degrees warmer than today!